LAS VEGAS – The International Church of Las Vegas takes the name seriously. It’s not quite a megachurch, but it strives for that, with stadium seating giving clear views of worship on the stage. 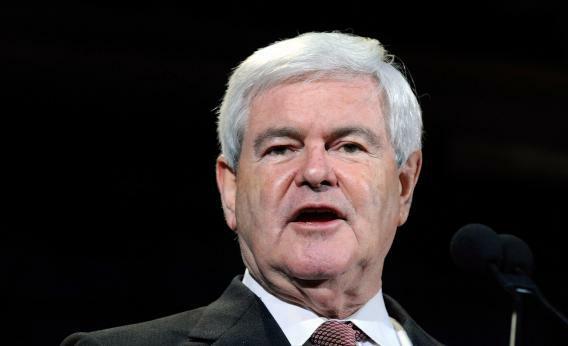 The ceiling hangs heavy with flags from every continent; the lobby, on Friday night, was full of merchandise for Newt Gingrich’s struggling presidential campaign. This church is part of the world, part of the political world. Proudly so. Before Gingrich spoke, Pastor Jim Garlow, the co-chair of Gingrich’s Faith Leaders Coalition, warned parishoners not to shy away from politics. Garlow’s quasi-sermon fit like a Jenga block into the argument all Gingrich surrogates make. They back a leader of Churchillian proportions; it would be a tragedy if he was brought down by Lilluputians. When he took the pulpit, Gingrich asked all of the children in the room younger than 12 to stand behind him.